Each year, the Tattoo has a different theme. In 2013, the theme was inspired by the Year of Natural Scotland. The various performances by the different artists were linked together by this theme of nature. To illustrate, four of the performances represented one of the seasons of the year while the grand finale alluded to Earth's place in the solar system. The theme was not intrusive. For the most part, you were only reminded of it by the narrator who introduced each segment of the performance. The artists seemed to be performing from their usual repertoires. Still, it all hung together nicely. Following the fanfare, the first group to enter the parade ground was the Massed Pipes and Drums. This is Scotland and so what could be more natural than bagpipe music. While the majority of the musicians were from various British Army regiments, there were also musicians from Oman and Malta. With the Massed Pipes and Drums were the Royal Edinburgh Military Tattoo Highland Dancers, who performed traditional and modern dances inspired by the evolution of life on earth. This was a thrilling opening act. 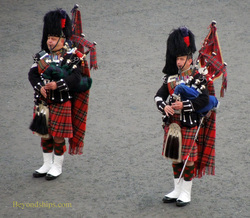 Bagpipes, in the right hands, have a magical quality that goes right to the soul. Above: The Massed Pipes and Drums included musicians from the Scots Guards, the Black Watch, Royal Regiment of Scotland, the Royal Tank Regiment, the Royal Irish Regiment, The Wallace Pipes and Drums of Malta, and the Royal Guard of Oman. 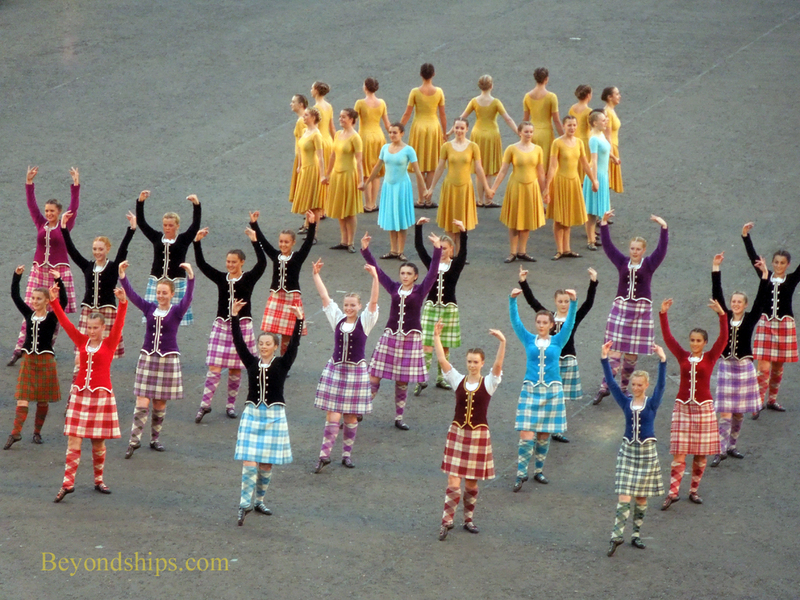 Below: The Royal Edinburgh Military Tattoo Highland Dancers. The first of the four seasons, Spring, was presented by the Republic of Korea Ministry of Defense Band and Dancers. These artists included both military and civilian personnel. Dressed in traditional costumes, the South Korean artists blended Asian and European styles in their performances. The dancers swirled slowly using their long dresses to create images reminiscent of flower blossoms. The drummers lively performances recalled the energy of the Spring. 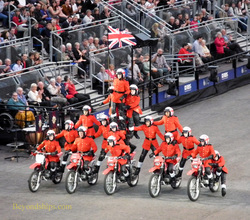 Following a choral performance by the Mary Erskine and Stewart's Melville Junior Choir, the motorcycle display team, the Imps, made an appearance. The team is made up of children ages 5 to 16 from London. Although there seemed to be little connection to the theme of the evening, the Imps gave a quite impressive performance of precision riding. 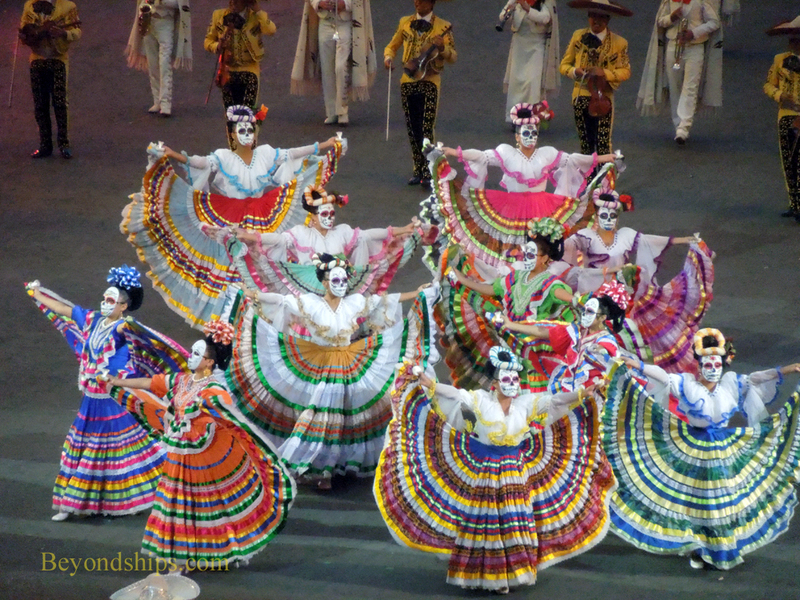 Three groups from Mexico, the Monumental Jaguares Band, Mariache Oro de Mexico and Compania de Danza Folklorica Tenochtitlan, brought in the Summer segment. The connection to the theme here seemed somewhat tenuous, seemingly based on the notion that summer is warm and so is Mexico. Despite being from three different groups, the artists combined to present a unified performance of traditional Mexican music and dancing. This included the only individual vocal performance of the evening. Their costumes were colorful and the performance was lively as well as fun.